These last ten years have been intense ones for his organisation, but the last two months have been truly hectic: WikiLeaks’ publication of Hillary Clinton’s and US Democrats’ emails hit headlines around the world. The US government hit back, accusing WikiLeaks of having received these materials from Russian cybercriminals with the political agenda of influencing the US elections, a claim some experts question. In the midst of these publications, Ecuador even cut off Julian Assange’s internet connection. Finally, in November, Swedish prosecutors travelled to London to question the WikiLeaks’ founder after six years of judicial paralysis. In a matter of a few weeks, they will be deciding whether to charge or absolve him once and for all. Next February, Ecuador will be holding political elections. 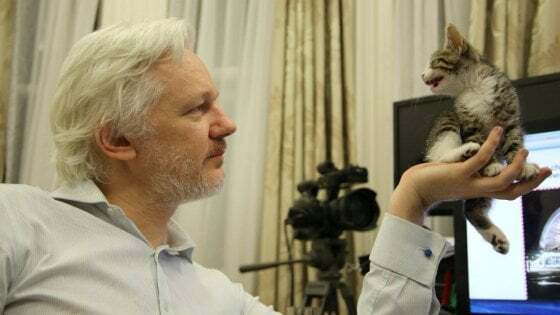 If Julian Assange loses asylum, will he be extradited to Sweden and then to the US? I had watched the Iraq War closely, and in the aftermath of the Iraq War a number of individuals from the security services, including the Australian [ones], came out saying how they had attempted to reveal information before the war began and had been thwarted. People who wanted to be whistleblowers before the Iraq war had not found a channel to get the information out. I felt that this was a general problem and set about to construct the system which could solve this problem in general. In Russia, there are many vibrant publications, online blogs, and Kremlin critics such as [Alexey] Navalny are part of that spectrum. There are also newspapers like “Novaya Gazeta”, in which different parts of society in Moscow are permitted to critique each other and it is tolerated, generally, because it isn’t a big TV channel that might have a mass popular effect, its audience is educated people in Moscow. So my interpretation is that in Russia there are competitors to WikiLeaks, and no WikiLeaks staff speak Russian, so for a strong culture which has its own language, you have to be seen as a local player. WikiLeaks is a predominantly English-speaking organisation with a website predominantly in English. We have published more than 800,000 documents about or referencing Russia and president Putin, so we do have quite a bit of coverage, but the majority of our publications come from Western sources, though not always. For example, we have published more than 2 million documents from Syria, including Bashar al-Assad personally. Sometimes we make a publication about a country and they will see WikiLeaks as a player within that country, like with Timor East and Kenya. The real determinant is how distant that culture is from English. Chinese culture is quite far away. We have published some things in Chinese. It is necessary to be seen as a local player and to adapt the language to the local culture. China banned us in 2007, we have worked around that censorship at various times, publishers there were too scared to publish [our documents]. The feeling is mixed within China: they of course like to see the Western critique that a number of our publications enable. China is not a militaristic society, they don’t see they have a comparative advantage in making warfare, so they presumably like general critiques of war, but it is a society that is authority-structured, which is terrified of dissidents, whereas if you compare it to Russia, it too is an increasingly authoritarian society, but one that has a cultural tradition of lionising dissidents. We publish full information, pristine archives, verifiable. That often makes it inconvenient for propaganda purposes, because for many organisations you see the good and the bad, and that makes the facts revealed harder to spin. If we go back to the Iraq War in 2003, let’s imagine US intelligence tried to leak us some of their internal reports on Iraq. Now we know from US intelligence reports that subsequently came out that there was internal doubt and scepticism about the claim that there were weapons of mass destruction in Iraq. Even though there was intense pressure on the intelligence services at the political level to create reports that supported the rush towards the war, internally their analysts were hedging. The White House, Downing Street, the New York Times, the Washington Post and CNN stripped off those doubts. If WikiLeaks had published those reports, these doubts would have been expressed and the war possibly adverted. What is the allegation here exactly? We published what the Democratic National Committee, John Podesta, Hillary Clinton’s campaign manager, and Hillary Clinton herself were saying about their own campaign, which the American people read and were very interested to read, and assessed the elements and characters, and then they made a decision. That decision was based on Hillary Clinton’s own words, her campaign manager’s own words. That’s democracy. No, we have been publishing about Hillary Clinton for many years, because of her position as Secretary of State. We have been publishing her cables since 2010 and her emails also. We are domain experts on Clinton and her post 2008 role in government. This is why it is natural for sources who have information on Hillary Clinton to come to us. They know we will understand its significance. We were pleased to see how much of the American public interacted with the material we published. That interaction was on both sides of politics, including those to the left of Hillary Clinton those who supported Bernie Sanders, who were able to see the structure of power within the Democratic National Committee (DNC) and how the Clintons had placed Debbie Wasserman Schultz to head up the DNC and as a result the DNC had tilted the scales of the process against Bernie Sanders. If the question is how I personally feel about the situation, I am mixed: Hillary Clinton and the network around her imprisoned one of our alleged sources for 35 years, Chelsea Manning, tortured her according to the United Nations, in order to implicate me personally. According to our publications Hillary Clinton was the chief proponent and the architect of the war against Libya. It is clear that she pursued this war as a staging effort for her Presidential bid. It wasn’t even a war for an ideological purpose. This war ended up producing the refugee crisis in Europe, changing the political colour of Europe, killing more than 40,000 people within a year in Libya, while the arms from Libya went to Mali and other places, boosting or causing civil wars, including the Syrian catastrophe. If someone and their network behave like that, then there are consequences. Internal and external opponents are generated. Now there is a separate question on what Donald Trump means. Hillary Clinton’s election would have been a consolidation of power in the existing ruling class of the United States. Donald Trump is not a DC insider, he is part of the wealthy ruling elite of the United States, and he is gathering around him a spectrum of other rich people and several idiosyncratic personalities. They do not by themselves form an existing structure, so it is a weak structure which is displacing and destabilising the pre-existing central power network within DC. It is a new patronage structure which will evolve rapidly, but at the moment its looseness means there are opportunities for change in the United States: change for the worse and change for the better”. Power is mostly the illusion of power. The Pentagon demanded we destroy our publications. We kept publishing. Clinton denounced us and said we were an attack on the entire “international community”. We kept publishing. I was put in prison and under house arrest. We kept publishing. We went head to head with the NSA getting Edward Snowden out of Hong Kong, we won and got him asylum. Clinton tried to destroy us and was herself destroyed. Elephants, it seems, can be brought down with string. Perhaps there are no elephants. That’s all politics, that’s something that people cannot properly understand, unless they been through the legal system themselves in high-profile cases. This decision by the UN in my case is really an historical decision. What is someone to do when they are in a multi-jurisdictional conflict, that is politicised and involves big powers? There is too much pressure for domestic courts to resist, so you need an international court with representation from different countries which are not allied to each other to be able to come to a fair decision. That is what happened in my situation. Sweden and the United Kingdom have refused to implement this decision so far, of course it costs both Sweden and the UK on a diplomatic level and the question is how long they are willing to pay that cost. Yes, we have contingency plans that you have seen in action when my Internet was cut off and while I was in prison before. An organisation like WikiLeaks cannot be structured such that a single person can be a point of failure in the organisation, it makes him or her a target. The internet has been returned. Yes, of course. Fortunately I’m too busy to think about these things all the time. I know that my family and my children are proud of me, that they benefit in some ways from having a father who knows some parts of the world and has become very good in a fight, but in other ways they suffer. My conclusion is that most power structures are deeply incompetent, staffed by people who don’t really believe in their institutions and that most power is the projection of the perception of power. And the more secretively it works, the more incompetent it is, because secrecy breeds incompetence, while openness breeds competence, because one can see and can compare actions and see which one is more competent. To keep up these appearances, institutional heads or political heads such as presidents spend most of the time trying to walk in front of the train and pretending that it is following them, but the direction is set by the tracks and by the engine of the train. Understanding that means that small and committed organisations can outmanoeuvre these institutional dinosaurs, like the State Department, the NSA or the CIA.